Based on the diversified expertise we have acquired from providing human resource support services, we can offer outsourcing service to cover all business tasks. Our specialized departments and group companies specifically created for each business area can respond to business needs by offering high-specialty services. Alleviation of task management burdens We can greatly reduce the task management burdens by comprehensively handle everything from the recruitment/training of required staff all the way to business operation and management. Improvement of job quality and productivity You will be requested to set the quality standards required of the tasks to be outsourced upon contract. We will then proceed to implement the required tasks by following the system designed to maintain quality (such as management cycle, work flow, manual, rules, training, etc.). Reduction of risks that come with fluctuating work volume We can build an operation system that responds to the required period and work volume. In order to respond to the increase in work volume during busy periods, we can also make fixed costs to variable costs. Focus management resources on core tasks By outsourcing non-core tasks such as routine tasks, you will be able to focus limited management resources on your core tasks. We have a profuse track record in a wide range of operations in various fields, based on which we propose the best solutions for you. We have a variety of operation staff ready to respond to various types of employment status and tasks—we allocate staff to fit to the required tasks, not the other way round. In addition, we can also start outsourcing early to secure the required operation staff within a short time. With our service network covering the entire Japan, we can speedily respond to any staffing needs in various regions. Our departments and group companies specializing in each job field are here to provide high-specialty services. After outsourcing service begins we will conduct improvement management and continue to propose improvements. 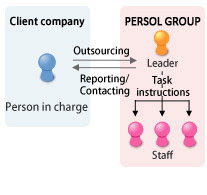 PERSOL GROUP provides services based on compliance. By combining adequate system and proposal of solutions, as well as thoroughly train the operation staff, we can establish an operation system that comply with laws and regulations. Furthermore, we also take measures on safety management from various aspects to protect confidential and personal information acquired, such as through devising various rules and establishing physical and technical measures. General reception / Assistant for guiding visitors to the waiting room / Receptionist / Telephone representative / Assistant for offering tea and water / etc. Sales agent / Check-out register / Information provision / Membership subscription promotion / Sampling / Market research / etc. In-warehouse work / Distribution processing / Inventory taking & shelving / Event / etc.